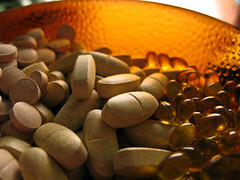 My mother told me recently that she has decided to take a vitamin supplement for seniors. When I asked why, she shrugged, “I don’t know. I think I need it.” In all of her 80 years, my mother has always been healthy (Bless her!). She does watch her weight, except for a few very temporary transgressions over the years. She’s still quite the active go-getter, who, after a restful night’s sleep, is always ready for a fresh start. I chose not to argue. After all, I thought, if taking a vitamin supplement makes her happy, why not? I was not totally convinced, however. Something kept niggling inside me. Vitamins (minerals, herbs, protein powders and shakes, etc.) don’t fight or prevent infection. The body’s defenses do this. Colds and sniffles are the result of virus infections. Effective hand washing does a lot more to prevent transmission. Children who are born with normal immune systems, are able to overcome these common childhood diseases. This is also one way to build immunity to such viruses. A large chunk of over-the-counter vitamins are made of vitamin C, a water-soluble vitamin, which if taken in excess, gets discarded in urine. They do result in expensive urine going down the toilet bowl. Supplements are useful and may be needed by children and other individuals who have an inborn inability to digest or process some foods. Or for individuals have a restrictive diet, for whatever reason—religious, cultural, socio-economic, philosophical, physical, etc. For example, in places where the norm is to eat polished rice, there can be higher incidences of vitamin B deficiency. Hence the necessity for supplementation. Giving your children vitamin supplements may give you and your children the false sense of protection from infections and give license to careless behavior. More recently, I’ve been reading scientific papers that argue that in some situations where there is an early development of abnormal cells in one’s system, these supplements, because of the high concentration they come in, may just feed the growth and development of such abnormalities and therefore, hasten the actualization of a malignancy. This new finding, although needing further definition and analysis, is quite disturbing and puts on notice all the fabled virtues showered on vitamins and minerals and whatever else is in vogue. I am reminded of Jude Law‘s character in Contagion, where he declares to his 12 million blog followers that forsythia, a homeopathic remedy, is the panacea for all that ails the world. The claim proved unfounded, and sadly, disastrous, as shown on the film. And yet, the supplements industry, whether all-natural, organic, homeopathic, scientifically sophisticated, is a multi-billion dollar industry. How much do people actually spend of their hard-earned income to feel good about themselves? That they can delay the aging process? That they can prevent infection and other diseases? That they can dodge the “C” word? That they will continue to look young and vibrant, just a little longer? And what about the latest darling of the industry, the gluten-free diet? Celiac Disease and all the associated disorders is a well-known inheritable total inability to tolerate gluten in whatever form. However, many people believe that their general health will improve, with the added bonus of desired weight-loss, if they follow a strict gluten-free diet, even if they are not really gluten-sensitive. I suppose, if such a diet helps you cut back on processed carbohydrates and steers you towards complex carbohydrates, it will contribute greatly to your general well-being. But no, there is no epidemic of Celia Disease all of a sudden in the world. So, ditch the dinner roll and dig-in to your favorite bowl of yard clippings! And so, I say, buyer beware. Don’t buy in to these fads so easily. Do your homework. Ask your physician. Ask for evidence. Go to the reliable websites where information is provided without bias towards some manufacturer or marketer. Before you pop those pills in your mouth! This entry was posted in dietary supplements, Health, Nutrition, Vitamins and tagged Dietary supplement, Health, Multivitamin, Nutrition, Vitamin. Bookmark the permalink. I’m guilty! I too take multivitamins. You’re right, most are psychological as well as media hype unless a deficiency is made as diagnosis. The best defense is still living a healthy lifestyle of proper diet, exercise and adequate sleep. Thanks. Wishing you and your family a lifetime of wonderful blessings.